Punjab residents on both sides of the border have long pushed for closer economic ties between their countries. India’s media is focusing on the likely winner of the 2017 Assembly elections in Indian Punjab, and whether or not the Aam Aadmi Party (AAP) will be able to extend its footprint by triumphing in Punjab. The party, which did not perform particularly well in the Lok Sabha Elections in 2014, managed to win five seats in Punjab. However, what the media overlooks is the fact that tensions with Pakistan are a major matter of concern for the landlocked, northwestern border state, especially within the business community. The fact that Indian Finance Minister Arun Jaitley will not be attending the South Asian Association for Regional Cooperation (SAARC) finance ministers meeting in Islamabad, only a few weeks after Home Minister Rajnath Singh attended the interior ministers conference, reiterates the fact that tensions have only increased and even economic ties with Pakistan have been put on the backburner, at least for the time being. In the past decade, whenever India and Pakistan made progress, it was in the economic sphere. Both Indian and Pakistani Punjab played a key role in pushing forward economic links, with landlocked East Punjab being especially enthusiastic. The push for economic links comes not just from successive governments, beginning with Captain Amarinder Singh’s (former Congress chief minister from 2002-2007, who is leading the party’s campaign for the 2017 elections); Chambers of Commerce, such as the PHD Chamber of Commerce and Lahore Chamber of Commerce, have also played a stellar role in creating constituencies for closer economic linkages, though of course the bilateral trade through the Wagah-Attari land crossing, estimated at $2.5 Billion remains way below its actual potential. The annual expos held on both sides of the Radcliffe Line, even during times of tension, may not have been able to influence policymakers on either side, but they have ensured that pragmatic minds from both sides of the divide keep at it and continue to explore synergies among numerous obstacles. One of the wrong notions within sections of the strategic community in Delhi is that the desire to improve ties with Pakistan is driven solely by nostalgia, or what is dubbed as the “Pappi-Jhappi” (“hugs and kisses” in Punjabi) sentiment; analysts often forget the economic factors. The desire of a businessman or farmer from Indian Punjab to have cordial relations with West Punjab is not driven solely by the sentimentality and nostalgia visible among immigrants from West Punjab, settled outside Punjab, but the possible economic benefits as well. This is not to say, that common culture or “Panjabiyat” can be totally obliterated in the relationship. The yearning and desire for a Sikh to visit historic Gurdwaras, including Nankana Sahib, Panja Sahib, and Dera Sahib, is extremely strong. There were high hopes with the election of the pro-business Pakistan Muslim League-Nawaz (PML-N) in Pakistan in 2013. Prime Minister Nawaz Sharif favors closer economic ties between the two countries and obviously realizes the benefits accruing to Pakistani Punjab. Within a few months, however, tensions between both countries rose and the scope for any meaningful engagement between both sides virtually disappeared. Even the Most Favored Nation status that was to be granted to India was put on hold, on the pretext that the PML-N would grant this once the new government is elected. This did not happen. 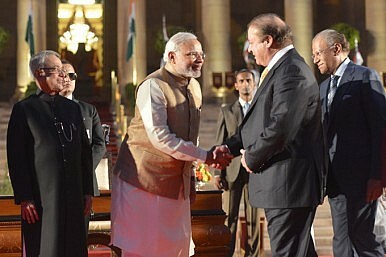 Indian Prime Minister Narendra Modi’s election in 2014 sent positive signals, with his focus on economic issues followed by his invitation to all SAARC leaders, including Sharif, to attend his swearing-in. Yet in his first few months after being elected, Modi’s BJP government decided to suspend talks after the Pakistan high commissioner in India met with Hurriyat leaders. Starting in December 2014, there were some significant course corrections. Modi was quick to condemn the dastardly attack at the Army Public School in Peshawar. In February 2015, Indian Petroleum Minister Dharmendra Pradhan attended a steering committee meeting for TAPI (the Turkmenistan-Afghanistan-Pakistan-India pipeline) in Islamabad and Modi also called his Pakistani counterpart on the eve of the Cricket World Cup to wish his team well. The Modi-Sharif meeting in Ufa in July 2015, on the sidelines of the BRICS and SCO summits, rekindled hopes of people-to-people contact along with revitalizing economic ties. Interestingly, one of the issues on the agenda was religious tourism. However, the July 2015 terrorist attack in Dinanagar dashed all hopes of any serious thaw. Modi’s impromptu stopover in Lahore in December 2015 once again was an encouraging step, but this too was followed by a terror attack — this time on the Indian Air Force base in Pathankot. The weakening of the PML-N government vis-a-vis the Pakistani military, rash statements even by the otherwise cautious Pakistani prime minister on Kashmir, and the further strengthening of Pakistan’s ties with China in recent months clearly imply that not just the military but even the civilian leadership is not particularly serious about meaningful engagement with India. The one stakeholder that should but does not have any say in Pakistan’s India policy–the business community–would be interested in strengthening the economic relationship given the fact that the China-Pakistan economic relationship is skewed in favor of China. For example, the Free Trade Agreement between both countries has been far from beneficial for Pakistan. On the Indian side too, there has been a greater focus on India’s eastern borders in order to bolster the Act East Policy, though business lobbies from Punjab have been urging the central government to address their logistical concerns and ease visa regimes. The India-Iran-Afghanistan trilateral agreement signed in May 2016 also means that New Delhi is less dependent upon Pakistan for access to Afghanistan and Central Asia and the significance of the Wagah-Attari land crossing clearly has been reduced in this context. While foreign policy is determined by national governments and driven by national interests, it remains to be seen whether the next government in Indian Punjab will attempt to play a constructive role in giving a boost to economic ties between both countries, or will prefer to be a quiet bystander. Tridivesh Singh Maini is a New Delhi based Policy Analyst associated with the Jindal School of International Affairs, OP Jindal Global University (Sonipat). His research interests include the role of the two Punjabs in India-Pakistan relations, and the China-Pakistan Economic Corridor. The Kartarpur corridor may be a good confidence-building measure between the two countries, but it’s not a game changer.